Apoptosis. 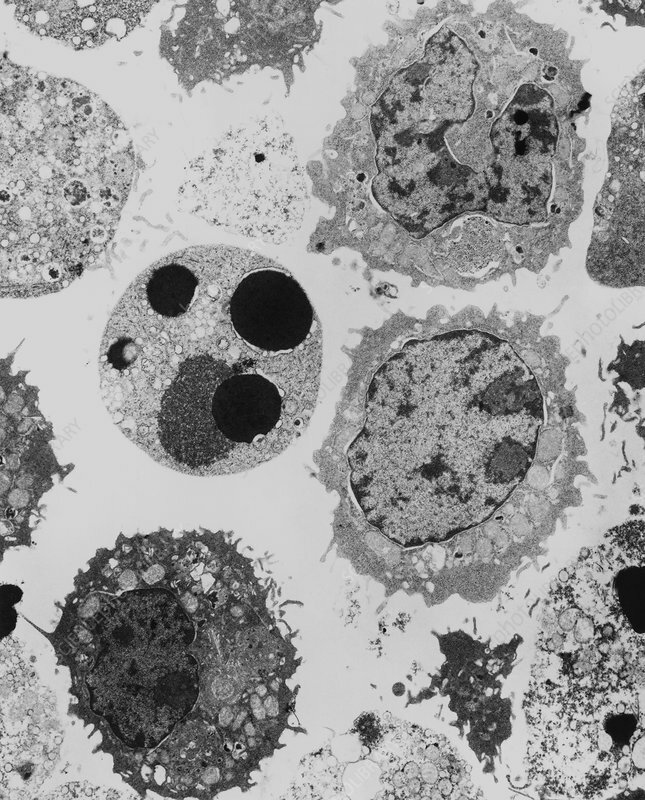 Transmission electron micrograph (TEM) of a section through a human myeloid white blood cell (leucocyte, centre left) undergoing apoptosis. Other healthy myeloid cells can be seen. Apoptosis is the process of genetically programmed cell death. The apoptotic cell no longer has the typical protuberances from its cell surface and its nucleus (black) is breaking down. Myeloid cells, which are found in the bone marrow, are the precursors for many types of leucocyte. Myeloid cells undergo apoptosis if they are deprived of growth factors. Research on apoptosis may provide genetic treatments for diseases like cancer. Magnification: x7500 at 7x8.5 inch size.